The biggest difference between a captive insurer and a commercial insurance company is that a captive cannot sell insurance to the general public. It can only underwrite the risks of its parent organzation or related entities. Another key difference is that the regulations governing captive insurance companies are typically less onerous than those regulations governing traditional commercial carriers. "It is my belief the insurance industry is broken and successful business people should take advantage of the federal laws that allow them to escape the hard and soft market cycles of traditional insurance and start their own insurance companies." A veteran of the insurance industry for more than 14 years, Sierk has summarized the key components of the captive insurance industry in this insightful, practical guidebook. Sierk believes that the very wealthy and sophisticated investors-the entrepreneurs and CEOs, the architects, real estate developers and builders, the professional athletes and entertainers, the hedge-fund managers and venture capitalists-should be considering alternative risk- financing strategies that are substantially more flexible than those offered by the traditional insurance industry. 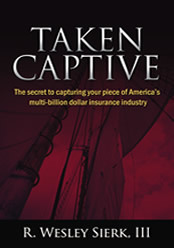 As this book reveals, in many cases these types of professionals should do more than purchase insurance, rather they should own their own insurance company, a captive insurance company. Sierk uses many examples to break down complex topics into easy-to-grasp guidance that covers basic definitions, the reasons to form a captive, the risks that can be underwritten, the formation process, and the process of managing a captive. He also covers the key tax advantages as well as the pitfalls for those who don't follow IRS and state insurance-regulatory guidance. Sierk discusses the history of the captive industry, the differences between offshore and onshore domiciles and the advantages of operating in certain jurisdictions. For anyone interested in learning more about this underutilized risk-financing strategy — from the basics through advanced concepts — Taken Captive will undoubtedly be an invaluable resource.